TED Prize winner Sugata Mitra is at the forefront of a new approach to education which challenges how we teach today’s children in a technological age. He is Professor of Educational Technology at Newcastle University, UK and previously a Visiting Professor at MIT in the US. Sugata is currently working on the School in the Cloud, which is the culmination of over a decade of research and observations from all over the world. The School in the Cloud is learning at the edge of chaos – a community, place and experience to discover and explore children’s learning as a self-organising system. 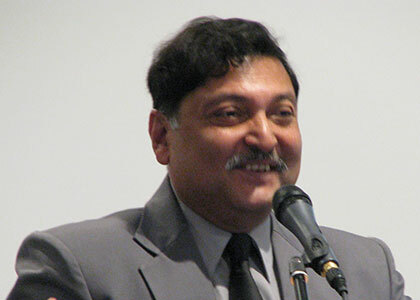 From his earliest experiments while working at NIIT in Delhi with the Hole in the Wall project, through to setting up SOLEs (self organised learning environments), Sugata discovered that children’s innate sense of learning is magnified when they are given the freedom to explore the internet in small groups. Children in these environments, regardless of who they are or what language they speak, can competently search for answers to ‘big questions’, drawing rational, logical conclusions from their research. These are questions far ahead of what is expected of them in their school curriculum. In 1999 Sugata and his colleagues at NIIT made a hole in a wall bordering an urban slum in Delhi, installed an internet-connected PC, and left to see what happened. Almost immediately, children from the slum began playing with the computer and in the process taught each other how to use it and get online. This experiment, which inspired the book ‘Slumdog Millionaire’ that went on to become the Oscar winning film of 2009, was replicated in other parts of India, both urban and rural, with similar results. It challenged some of the key assumptions of formal education, demonstrating that, even in the absence of any direct input from a teacher, an environment that stimulates curiosity could result in learning through self-instruction and peer-shared knowledge. However, his research has shown that it’s not simply a case of taking teachers out of the equation: children in remote areas often perform poorly at school because they do not have access to good teaching. As a result of further research which showed the importance of an encouraging adult in these circumstances, the Granny Cloud was born, after Sugata put out a plea for retired teachers in the UK to come forward who were willing to interact with children in India via Skype.